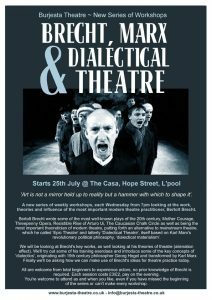 A series of workshops dedicated to looking at the theatre and influence of Bertolt Brecht’s ‘epic’ or ‘dialectical’ theatre. We continue this week to look at Brecht’s ‘alienated’ style of acting, focusing on the influence that Chinese theatre had on Brecht. There is no workshop next week, Wednesday 12th September. Workshops resume on Wednesday 19th September with our ongoing series, ‘Brecht, Marx and Dialectical Theatre’. Details for that workshop will be posted closer to the time. A series of workshops looking at the theatre output and influence of Bertolt Brecht on modern theatre. This week we continue to look at Brecht’s ‘alienated’ style of acting with a devised piece of theatre incorporating his ideas. We continue our series of workshops looking at the work and influence of Bertolt Brecht on modern theatre practice. 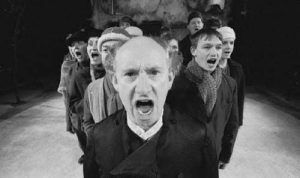 This week we continue to look at the acting style that Brecht proposed known as the ‘alienation effect’ with exercises and devised work as well as looking at some of the key concepts that informed Brecht’s political world-view. We’ll be looking at ‘dialectics’, as espoused by 19th century German philosopher Georg Hegel and as Karl Marx developed it as ‘dialectical materialism’. Join us this Wednesday as we continue our exploration of Brecht’s influence on modern theatre. We’ll be trying out some of his advice and theories for actors as he attempted to create a new ‘epic’ or ‘dialectical’ theatre with acting that was authentic and didn’t use manipulative techniques to affect the audience. All welcome, no experience or knowledge of Brecht required to take part in these sessions…. This Wednesday we continue with our look at Brecht’s theatre and influence on theatre. We’ll be looking at more of Brecht’s ‘alienated’ form of acting and aiming to apply his theories to our own practice. This week we continue to look at Brecht’s influence on modern theatre focusing on one of his ‘Lehrstucke’ ‘learning plays’, ‘He Said Yes / He Said No’ with two contradictory endings to what was originally a Japanese fable. These ‘learning plays’ were teaching instruments for actors to learn his new style of ‘epic’ or ‘dialectical’ theatre. Following on from Brecht, we’ll also be asking participants to come up with their own ‘learning play’. All are welcome from total beginners to experienced actors. No prior knowledge of Brecht is required, there is no obligation to attend each workshop (just pay £3/£2 on the night) and you can still come along even if you haven’t attended previous workshops in this series. This coming Wednesday we have the second in a series of workshops looking at Brecht’s theatre and influence with extracts from ‘Fear and Misery of the Third Reich’ and a look at Brecht’s theoretical differences between ‘Dramatic Theatre and ‘Epic or Dialectical Theatre’. All are welcome from beginner to experienced actor, with no prior knowledge of Brecht required and no necessity to attend every workshop. Each workshop costs £3/£2. Don’t worry if this all sounds over-awing please come along and throw yourself into it and have fun in learning something new! For those who couldn’t make the first session a reminder that in preparation for this coming workshop we asked you to conduct some homework: as you go about your business, maybe having a coffee in a cafe or waiting for a train or a bus watch people’s interactions in the street and observe in as much detail as you can a particular interaction, conversation or what have you around you. Record mentally in as much details as you can, what is said, how it is said, how people act and enact stories between themselves and then bring it along for this week’s session (no need to write it down, just have it in your mind’s eye. Please find below an outline of notes from the first session from ‘the street accident’ which give some of Brecht’s key thoughts on creating ‘epic’ or ‘dialectical’ theatre which will be of use for you to read before this weeks session. ‘It is comparatively easy to set up a basic model for epic theatre. For practical experiments I usually picked as my example of completely simple, ‘natural’ epic theatre an incident such as can be seen at any street corner: an eyewitness demonstrating to a collection of people how a traffic accident took place. The bystanders may not have observed what happened, or they may simply not agree with him, may ‘see things in a different way’, the point is that the demonstrator acts the behaviour of the driver or the victim or both in such a way that the bystanders are able to form an opinion about the accident’. Brecht goes on to say that if the elements contained in this exercise are not present in ‘epic theatre’ proper then it is not ‘epic theatre’. He is not to make his performance act as an ‘experience’ for the audience. Another element should be that epic theatre has ‘socially practical significance’, that the actions of one person let to this result, different actions would have led to different results. The demonstrator should only use such characterization as is necessary to reveal his thoughts about the person, that they were acting selfishly or unreasonably, rather than a complete character profile. Characterization should be developed from their actions not the other way around. This means that character or human nature is not fixed but based on social norms of the society around them and their response to it. In short the actor must remain a demonstrator, he must present the person demonstrated as a stranger, he must not suppress the ‘he did that, he said that’ element in his performance. He must not go so far as to be wholly transformed into the person demonstrated. The feelings and opinions of the two are not merged into one. The Alienation effect is achieved by paying exact attention to what the person did, in our example, he walked off the kerb with his left leg, not his right (as one audience member might comment). By being so precise we alienate specific behaviour, that is draw it out so it is seen as critical, we can also comment on its significance, if he hadn’t of done so this wouldn’t have happened, allowing the audience, too, to draw conclusions from our demonstration. The performance’s origins (should) lie in an incident that can be judged one way or another, that may repeat itself in different forms and is not finished but is bound to have consequences so that this judgement has some significance. The object of the performance is to make it easier to give an opinion on the incident. ‘Art is not a mirror held up to reality but a hammer with which to shape it’. A new series of weekly workshops, each Wednesday from 7pm looking at the work, theories and influence of the most important modern theatre practitioner, Bertolt Brecht. Bertolt Brecht wrote some of the most well-known plays of the 20th century, Mother Courage, Threepenny Opera, Resistible Rise of Arturo Ui, The Caucasian Chalk Circle as well as being the most important theoretician of modern theatre, putting forth an alternative to mainstream theatre, which he called ‘Epic Theatre’ and latterly ‘Dialectical Theatre’, itself based on Karl Marx’s revolutionary political philosophy, ‘dialectical materialism’. We will be looking at Brecht’s key works, as well looking at his theories of theatre (alienation effect). We’ll try out some of his training exercises and introduce some of the key concepts of ‘dialectics’, originating with 19th century philosopher Georg Hegel and transformed by Karl Marx. Finally we’ll be asking how we can make use of Brecht’s ideas for theatre practice today. All are welcome from total beginners to experience actors, no prior knowledge of Brecht is required. Each session costs £3/£2, pay on the evening.